FYI SOUTH Magazine, September 2006. Having surfed near perfect 6 foot waves at Jeffrey's Bay, South Africa, I was convinced that I would have to put my beloved sport on hold when I came to Taiwan. But then, two days before a typhoon was about to hit, I received a call from a friend: "Get ready! It's going to be cooking tomorrow." Skeptically I drove down to a reef past Jialeshuei - and had one of the best sessions of my life! Surfing was born an age ago, when Hawaiian fishermen started riding the waves on large wooden planks and found it to be just about the most fun you could have with your Hula on. Over the years it grew into the international, professional and incredibly athletic sport that it is today. From 18-year olds traveling across the globe in search of perfect waves, to 81-year olds claiming sovereignty over their private breaks, it remains the love of riding the waves that pulls us into the water. So why exactly is surfing so popular? Simple: 1. Ocean gives life to mankind. 2. Mankind relies on ocean for life. 3. Mankind sees in ocean most of life's might, magic and mystery. 4. Mankind longs to (with a necessary degree of awe and respect) discover and tame ocean. 5. Man sees man attempt and achieve this, and thinks: "That looks like the good life!" Conclusion (albeit rather zealous) = Surfing is life! Let's get back to reality - and surfing south Taiwan. To start you'll need a surfboard. There are many places that rent surfboards down in the Kenting area, although these boards tend to be clumsy, foam monstrosities that may frustrate you as much as amuse you. In this writer's opinion, beginners (weighing between 55kg - 70kg) should look for a 6'4 (6 foot, 4 inches) fibre-glass covered board with three fins and a sturdy leash. Owning your own board is best, but ask Clair (owner of Waves Kitchen and Bossa Nova - page 11), A-Lang (Kenting Surf Shop - page 26) or Winson (Winson House, Jialeshuei) about renting a board. Taiwan's warm waters don't require the use of wetsuits, but a rash vest (or T-shirt) will help prevent serious chafing and acts as additional protection against the sun. ALWAYS wear sunblock (especially on your face), since the water reflects harmful UV rays and you'll be crispy before you know it. Finally you will need the most important thing of all - decent waves. The underwater topography of the ocean floor defines the waves that are formed when swells reach the shore, and beginners should stick to open beach breaks that are less intimidating and within the limits of their experience and fitness. 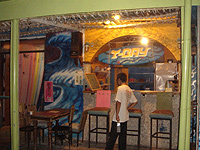 Try the right-hand corner of NanWan beach or Jialeshuei. Always be respectful of locals and more experienced surfers. Try to watch and learn, rather than compete with them for waves. 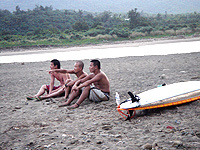 A good place to meet fellow surfers is Winson House, just up the road from Jialeshuei beach. An avid surfer himself, Winson offers board rentals at NT$800 per day (NT$500 for a half day), decent accommodation at NT$400 per night (NT$300 on weekdays) and surf lessons at NT$1800 for 3 hours (NT$1280/person for 2 or more; max 10) from 9am to 12am and again from 2pm to sunset. It is this writer's opinion that surfing is 10% skill, 10% talent, 10% knowledge and 70% fitness and experience, which you will only build by being out in the water. Luckily it is the most fun, exciting and satisfying way to get and stay fit. See you in the water. www.surfing-waves.com - tips on learning how to surf, equipment and related stuff.